We offer off lease and new notebooks. Our favorites are made by Hewlett Packard’s Elite series line. There are two models that pass all of our recommendations and torture tests. They perform and cool very well and have the power of a Desktop computer system. We offer the Elite line from HP as off-lease computers from the Federal government. They not only pass the tests from the Fed., but also pass our tests for quality and dependability. These are what I choose to use personally, so they just might work out for you too. Call us for more information. HP Elite Towers in the models that we sell are built extremely well and are designed with performance and stability in mind. For those of us that love stable computing and consistent performance for all of the computer tasks that we do, this is the best answer for us. 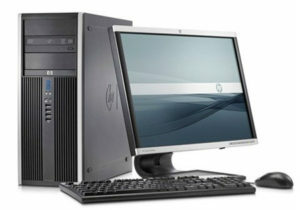 Always featuring Intel i series multi-core processors, these workstations make easy work of almost all computing tasks. They cool well, have lots of USB ports and manage energy well for lower operational costs. We customize these to suit your needs.